There’s so much more to Lanzarote than just great weather and beautiful beaches. As this small island in the Canaries is surprisingly big on visitor attractions, making it an ideal holiday destination for anyone keen to combine sunbathing with sightseeing. Lanzarote is home to some amazing and surreal volcanic scenery – most of which was created by the modern world’s longest ever eruption, which rocked the island for six years during the 1730’s. This obviously caused enormous devastation at the time, sweeping away villages and submerging once fertile farmland beneath a sea of solid lava. But today these raw and eerie landscapes attract over one million visitors a year – all drawn to these lunar like landscapes which are literally out of this world. The influence of the local artist César Manrique is inescapable on Lanzarote. He not only battled successfully against over development when tourism was first taking off, but also resolved to work in harmony with Lanzarote’s rugged landscapes in order to create ecologically friendly visitor attractions. So providing an alternative path to the theme parks and golf courses being built in other Spanish sunspots at this time. His grandest and best known creation is the Jameos del Agua, which was hailed as the “8th Wonder of the World” when it was visited by the Hollywood legend Rita Heyworth in the late 1960’s. A jameos is a collapsed lava tunnel and the Jameos del Agua forms part of the largest such tube in the world. It was being used as a rubbish tip by locals before Manrique transformed it into a stunning concert venue and nightclub – and today boasts verdant tropical gardens, a sea water fed lagoon populated by a species of blind albino crab that is unique to Lanzarote and a breathtaking swimming pool that is allegedly reserved for the sole use of the King of Spain. 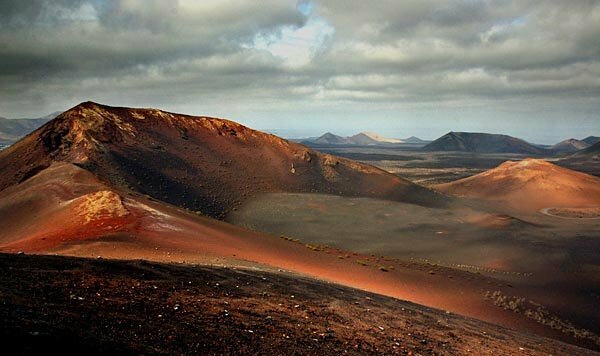 Many first time visitors are shocked by Lanzarote’s arid and barren landscapes – a topology created by a mixture of very low rainfall and the volcanic terrain. So the Valley of 1000 Palms comes as an even greater surprise as it provides such a striking contrast to the rest of the island. It is located in the north and benefits from higher levels of precipitation than the rest of Lanzarote. Along with an army of locals who adhere to a centuries old tradition of planting palm trees for ever new born baby in the village of Haria, which nestles on the valley floor. Another fine example of Manrique magic, the Mirador del Rio started life as a gun battery located some 500 metres up on the Famara massif in the north of Lanzarote. Manrique converted this shell into an amazing lookout point (mirar is the Spanish verb, to look), which gives visitors breathtaking views of the small neighbouring island of La Graciosa below. 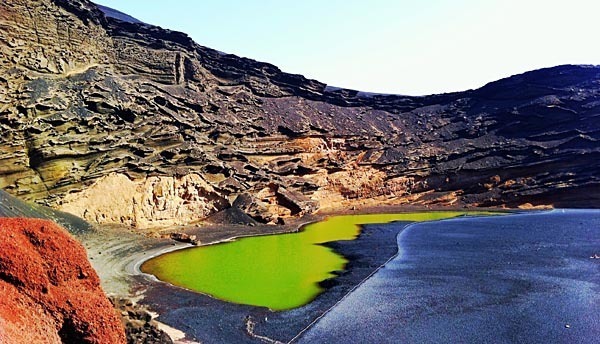 Lanzarote’s volcanic landscapes have provided the backdrop for numerous films – and the Green Lagoon at El Golfo is one of the most cinematic spots on the island. It was here for example that Raquel Welch memorably emerged from the ocean in an animal skin bikini in the sci-fi classic One Million Years BC. The real star of the show here though is the famous green lagoon – also known locally as El Charco de los Clicos – which has been created by an interaction between the sea water that feeds the lake and the algae contained within it. Resulting in the arresting sight of an emerald coloured lagoon trapped within a black sand beach, just yards from the blue waters of the Atlantic Ocean. Last updated by Nick Ball on 14 March, 2012 in Travel.